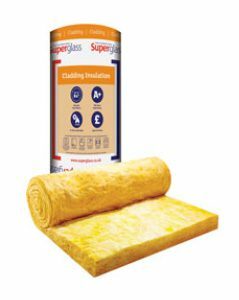 Superglass Cladding Mat 40 is a resilient, medium dense and non-combustible glass mineral wool insulation roll with exceptional durability and high tear strength. The roll is supplied 1200mm wide to allow quick installation and minimum on-site cutting and waste. Superglass Cladding Mat 40 is designed to provide thermal and acoustic insulation in the walls and roofs of profiled metal clad buildings and portable buildings.